Fall and winter are the biggest seasons for soup, especially on cold, dark, dreary rainy or snowy days. Add to that being sick, when you don't feel like eating much of anything, and soup might be the only thing that your stomach and system will tolerate. I was talking with one of the women at work, Dee, about chicken matzoh ball soup, which is my favourite. I don't care if the matzah balls are light or dense, as long as they are bigger than golf balls. Dee then stated she made the best chicken matzoh ball soup. After talking about it all afternoon, she decided that she was going to make it later that night for her family. I asked if she would bring me a container; she agreed after much begging and pleading on my part. When I got to work on Saturday, she told me there was a container of soup in the refrigerator for me, so don't forget about it at lunch. Of course, I forgot. I went back a couple of hours later and ate half of the container. It was great! 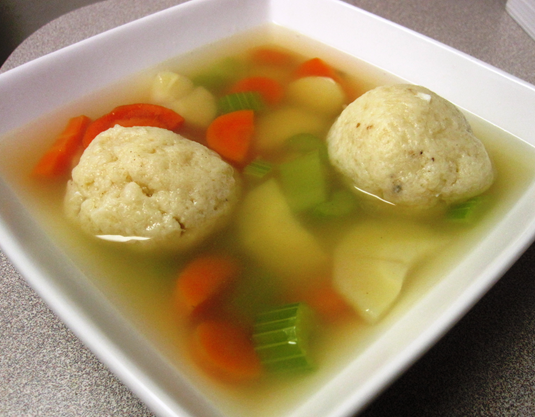 Her matzoh soup included a great deal of white and dark chicken, celery and carrots and, yes, one big matzoh ball! Oh my gawd, it was the best matzoh ball I evet ate, beating out even my grandmother's soup. I told Dee so. She seemed pleased that I enjoyed it. When I saw Dee this morning, she told me that she brought in her escarole and ham soup. The container was in the back, waiting for me. Since I had brought in the other half of the chicken matzoh ball soup, I figured I'd take the escarole and ham soup home and enjoy it on Monday or Tuesday, when I was off. I told Dee I used to work in Flushing, Queens, many years ago and right across the street from us was everything. That means we had a dry cleaner and tailor, Chinese food, pizzeria and a deli. Let me tell you that the deli made the best beef barley soup ever, ever. Dee stated that she made that as well, so I'm waiting for her to bring in that. I think anyone that cooks from scratch appreciates a good audience. Dee certainly has one in me. Who remembers the episode, of Seinfeld, that dealt with the "The Soup Nazi," played by actor Larry Thomas? Episode, written by Spike Feresten, aired on 2 November 1995. The inspiration, for the episode, was the real soup man, Ali "Al" Yeganeh. He runs a chain of soup restaurants, mostly franchises in the USA and Canada, called "The Original Soup Man." After the Seinfeld episode, Yeganeh banned the use of the word Nazi in his stores by the staff and in advertising as well. He doesn't do live interviews. He only answers questions via email. In the “Soup Nazi” episode of Seinfeld, there was a strict protocol, a script, for ordering soup. If the customer did it incorrectly or did something to anger the soup man, the soup order was withdrawn, the money refunded and the chef yelled at them, "No soup for you!" That line will live forever in the lexicon of sitcom catch phrases. I believe that the two biggest companies that make canned soup are Campbell and Progresso. I love chicken soup and, as much I liked Campbell soup, as a kid, I like Progresso better now because it's not condensed. There are also larger pieces of chicken in Progresso, along with celery and carrots. That's mostly what I ate when I was sick this winter. The above tag line, which everyone remembers and will live forever in advertising history, is from The Campbell Soup Company.